When this card is activated: You can add 1 “Trickstar” monster from your Deck to your hand. Once per turn: You can target 1 Set card in your opponent’s Spell & Trap Zone; while this card is in the Field Zone, that Set card cannot be activated until the End Phase, and your opponent must activate it during the End Phase or else send it to the GY. Each time a “Trickstar” monster you control inflicts battle or effect damage to your opponent, inflict 200 damage to them. Trickstar Light Stage is a great Field Spell for the archetype, and a Field Spell that could be used in other decks. Searches out a Trickstar monster when activated, that’s good. Dishes out 200LP damage each time a Trickstar does burn or battle damage, that will add up over time alongside the burn effects of Candina, Lycoris, and Reincarnation. What really helps this card be a good card for other archetypes is the lockdown effect. Each turn you can lockdown a set spell/trap, then force the activation in the End Phase. If they can’t (something like Torrential Tribute), they lose it. I love this effect. Cards like Warning, Strike, and Torrential get nuked by this card so easily. If this was only a one-time thing it’d be a good card, but every turn? This is a fantastic card if you want to run a field-controlling card(s) in your deck. Also, it gives you a card to use as fodder for effects. Trickstar Light Stage is pretty much perfect for Trickstars. This free Field Spell Card let’s you search any Trickstar monster from the deck to the hand upon activation. That’s not even once per turn, so go ahead and use multiple. A searchable search card makes just the first effect alone awesome. The once per turn second effect lets you target a set opponent’s Spell or Trap so that it cannot be activated that turn and will be sent to the grave if it cannot be activated in the End Phase. Still a free effect, still awesome. Finally, the burn effect, again free, burns for 200 Life Points every time a Trickster monster inflicts battle or effect damage to the opponent. That’s not optional. Essentially, every Trickstar monster does double burn damage, and their attack stats become more useful. Moon Mirror Shield anyone? I wish Trickstar Light Stage boosted some Atk points, but then it might be too good. Every archetype gets a Field Spell now, and Trickstars are no exception, they even have other Field Spells but here is their best one, Trickstar Light Stage. Light Stage is a Field Spell that when activated lets you add a Trickstar monster from your deck to your hand. How many Field Spells search now a days? Oh well, searching is still very strong and I don’t see a hard once per turn clause on that effect so you can use multiple Light Stages to get multiple monsters like Candina, Lilybell, Lycoris, or Calobane. Once per turn, you can target 1 Set Spell/Trap in your opponent’s Spell/Trap zone and that Set card cannot be activated until the End Phase and your opponent must activate it during the End Phase if they’re able, otherwise it is sent to the GY. Locking down a powerful counter to your plays and getting rid of it at the end of the turn is going to be annoying to deal with. Backrow is important for a player to have if they are playing it, that is why the TCG still has Harpie’s Feather Duster banned along with Heavy Storm and Giant Trunade. Light Stage doesn’t get rid of as much as the previously mentioned cards, but it can hurt when your opponent plays light backrow. Finally, each time a Trickstar inflicts damage to the opponent, by battle or card effect, inflict another 200 damage to your opponent. More damage to stack onto what you’re already doing. Spell/Trap activations will cost your opponent 400 with Candina, searching will cost at least 400 for Lycoris assuming they only add one card, and more burn effects plus that’s 200 damage on top of ATK values of 800, 1800, 1600, 2000, etc. that the deck has. Light Stage searches, locks down backrow, and deals more damage over time. What is there not to like about this card in the deck? Art: 4/5 If the Code of the Duelist Trickstars were the only ones, then the gang would all be there. Lots of Text on this card, but does that mean anything? Trickstar Light Stage is a Field Magic card, so let’s see if it’s a success, or a flop. 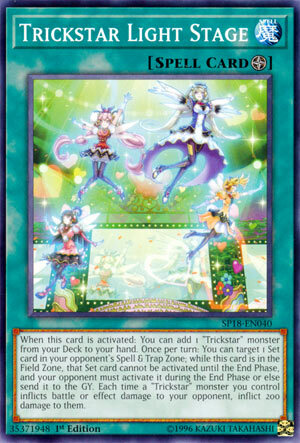 First, upon activation, it nets you a Trickstar Monster from your Deck to your Hand. A +1 upon activation is muy bueno, so that’s absolutely an asset to start. Next is a very balanced lock-out/control effect to the opponent’s back-row. You’re able to Target one of your opponent’s Magic/Trap cards (which must be Set) and it can’t be activated until the End Phase. At the End Phase, your opponent MUST activate it, or they have to send it to the Graveyard. Worth noting, you have to have this card in the Field Zone, which makes sense as the effect comes from this card, but carrying on. More Damage via burn here, but more open with it as well. Light Stage inflicts 200 Damage (that sounds familiar) each time your Trickstar Monster(s) inflict Battle OR Effect Damage to your opponent. We see very quickly why the Damage is capped at the 200, as if you keep it on the Field long enough, you can inflict considerable Damage and win. Very annoying indeed. Rating: It’s definitely one of the playable Field Magics we have, great synergy with the theme, nets a resource, continues to burn, 5/5 for the Theme. Art: 5/5 Love all the different Monsters shown, love the colors and acrobatics being performed, just fantastic.